They recently announced that the hugely popular Monster High doll line and animated web-series will be getting a live-action version. I am pretty much entirely opposed to this idea but of course as soon as I heard “live-action” my brain started fan-casting these characters that I (even as an adult) admitting love. So here you go. Emma Roberts as Frankie Stein. Emma’s got that girl-next-door attitude down pat and would be perfect as the line’s main protagonist, wholesome new girl Frankie. 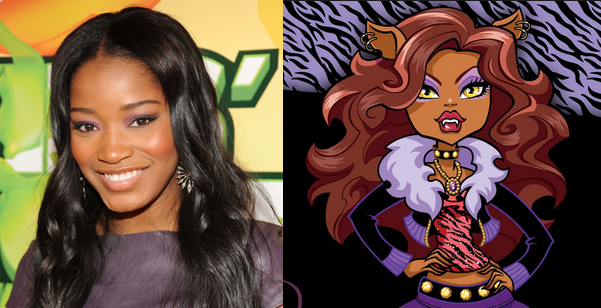 Keke Palmer as Clawdeen Wolf. 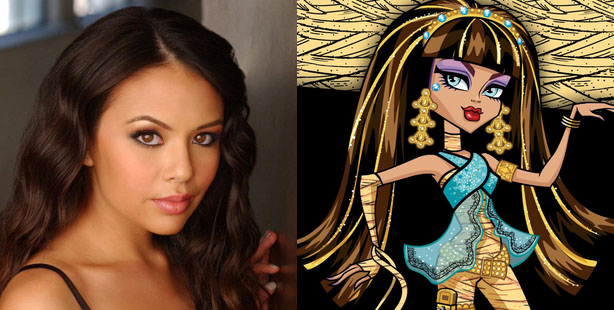 Keke from True Jackson VP is pretty, fierce, and fabulous; just like Monster High’s resident fashionista Clawdeen. Janel Parrish as Cleo de Nile. Janel knocks it out of the park on Pretty Little Liars as mean (and sometimes crazy) girl Mona and she would be equally adept as Queen Bee Cleo. Lucy Hale as Draculaura. Pretty Little Liars’ Lucy Hale is perfect to play the petite romantic girly-girl Draculaura, and she has the dark-haired beauty down pat too! Claire Holt as Lagoona Blue. Aussie Claire Holt from The Vampire Diaries has the same beachy style and blonde locks as Monster High’s laid-back animal lover from down under. Cristine Prosperi as Ghoulia Yelps. Cristine, who plays Imogen on Degrassi, has the perfect mix of adorable brainy girl and fierce best friend to play the uber-intelligent Ghoulia. ThomasDekker as Deuce Gorgon. Thomas has that suave popular-guy attitude that would be perfect for Cleo’s laid-back boyfriend. 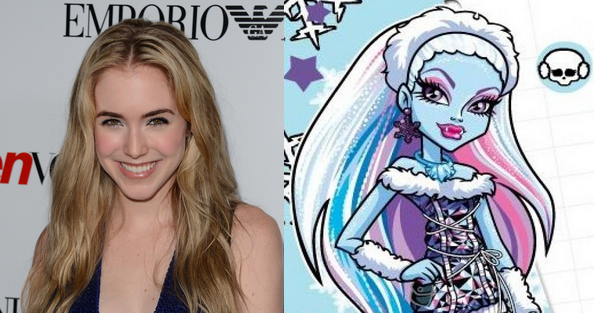 Spencer Locke as Abbey Bominable. From her roles in Resident Evil and Detention, Spencer has proven herself capable of playing an ice queen with a warm heart, just like Abbey herself. Corbin Bleu as Clawd Wolf. Corbin is my choice for super-jock and nice guy Clawd, who is not only Clawdeen’s brother but also Draculaura’s boyfriend. Ariana Grande as Operetta. Singer and actress Ariana isn’t just perfect for music-loving Operetta because of her bright pink hair; she’s also got some great pipes on her just like Monster High’s best singer. Jeremy Sumpter as Heath Burns. Jeremy’s fun role as Peter Pan reminds me of sometimes-awkward jokster Heath Burns and I think he would bring the right balance of endearing and ridiculous. 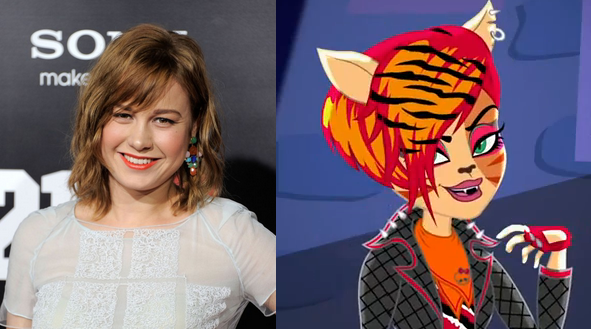 Brie Larson as Toralei Stripe. Brie Larson’s reputation for being sassy and spunky makes her the perfect fit for mean girl Toralei. 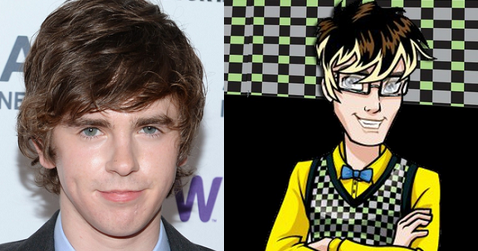 Freddie Highmore as Jackson Jekyll. Equally adorable and funny Freddie Highmore is just right for the shy Jackson who tries to woo Frankie while dealing with his alternate personality. 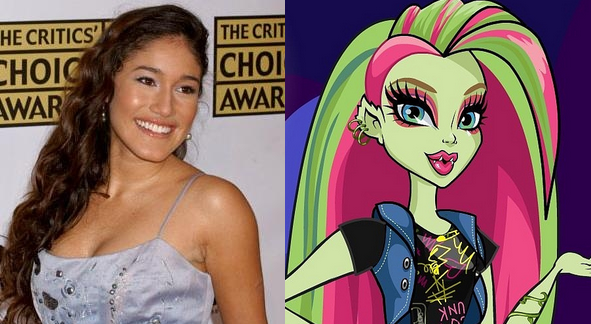 Q’orianka Kilcher as Venus McFlytrap. Like the plant-loving Venus, Q’orianka is known for being an environmental activist so she would definitely understand this character. Katerina Graham as Robecca Steam. The Vampire Diaries’ Kat Graham has a dance background which would be perfect for the Skultimate Roller Maze champion. Phoebe Tonkin as Spectra Vondergeist. Phoeie’s haunting good looks and enchating otherwordly persona makes her the perfect choice for journalist and gossip-hound Spectra. Jemima West as Rochelle Goyle. Just like Rochelle, The Mortal Instruments’ Jemima West hails from Paris, France. Her mysterious attitude on The Borgias is perfect for stoney Rochelle. 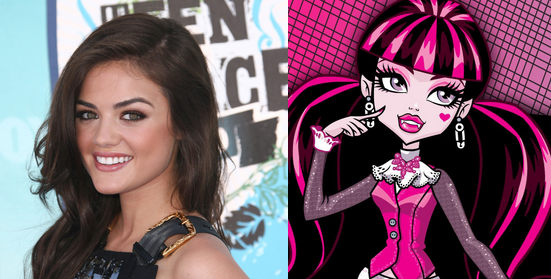 Zendaya as Howleen Wolf. 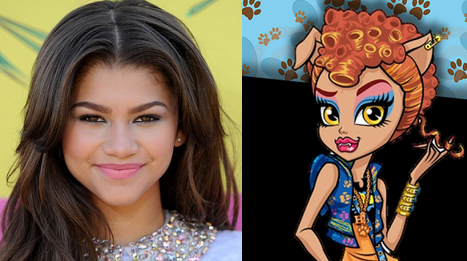 Zendaya is the perfect age and has the right amount of attitude to play Clawdeen’s popularity-hunger younger sister. Wenwen Han as Jinafire Long. 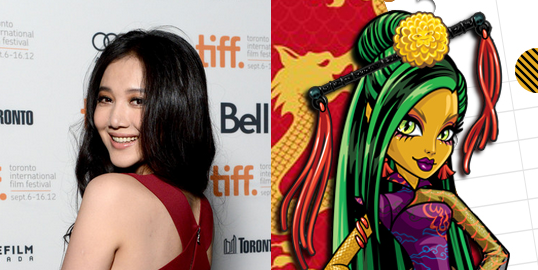 China-born Wenwen from The Karate Kid would be a great choice for Jinafire Long, Monster’s High’s fiery and brave transfer student from China. Selena Gomez as Skelitta. 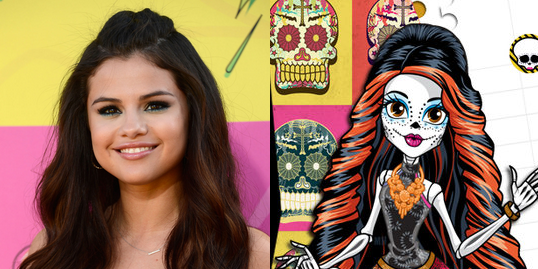 Uber-famous actress and singer Selena Gomez would be the ideal choice for fun-loving Mexican transfer student Skelitta. Jodelle Ferland as Sarah Screams. Jodelle Ferland, known for her roles in horror films like Silent Hill and Case 39 has a very ghostly (but pretty!) look about her which matches perfectly with shy Sarah. Emily Browning as Twyla. Emily’s ethereal beauty and ellusive nature is the same as that of the Boogeyman’s daughter, the sometimes misunderstood Twyla. Riley Keough as Gigi Grant. Indie actress Riley Keough is my choice for daydreamer genie, Gigi Grant because they both have a whimsical quality about them. 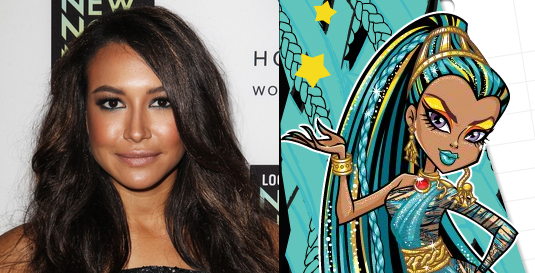 Naya Rivera as Nefera de Nile. Feisty and sometimes mean on Glee, Naya is the best choice for Cleo’s not-so-nice big sister Nefera. Amber Riley as Catty Noir. Amber Riley’s incredibly impressive vocal chords would make her a perfect Catty Noir, the biggest pop singer in Monster High history. Normani Kordei should play Clawdee. Good list. I don’t know why they feel the need to make a live action version. The cartoon is great on its own. Oh well, guess that means more figures for the foreseeable future. Great casting call especially the main ladies! 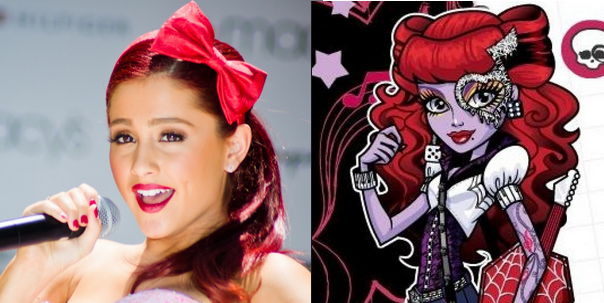 I think you hit gold with Ariana Grande as Operetta (my favorite Monster High character!) And while this cast seems pretty perfect, I still have my doubts about a live-action version. Feels unnecessary.